Robert Toth is back in the movies again. The artist recently received a call from Columbia Pictures to purchase four of his Darwin sculptures for the movie "Salt," starring Angelina Jolie, filming in Manhattan and at the Smithsonian Institute. Toth believes that the film will be released by next spring. The initial order was for one sculpture, but Columbia Pictures later ordered three additional sculptures because they will be filming at four locations, Toth says. "I believe the sculpture will be on a scientist's desk and in an office," Toth says. "The scientist plays the part of Angelina Jolie's boyfriend in the movie." 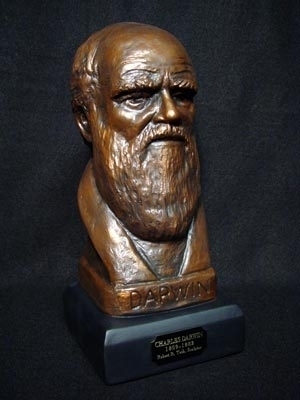 Toth says he heard from one of the set decorators from Columbia Pictures that when one of the actors threw the Darwin sculpture through a glass window at Jolie, it survived without getting a scratch on it. "A good endorsment for my product," Toth says. Toth has had his work used in other films, including "The Amityville Horror" and "Scary Movie 3." His work also appeared in a television series called "Cracking Up." For more information about Toth's work, go to www.roberttoth.com.